the us of a is in deep trouble. as other people, i really suffer with all the persons that are hit by the hurricane in the states. but if you watch those two videos below, you really get a sense on how deep the trouble is gonna be once all the news get trough. the first video shows two reporters of fox news really freaking out while giving their impression of the crisis. you should watch both videos to the end to see the important part! “Bush doesn’t care about black people” I wouldn’t be surprised if it part of his administrations plans to specifically decrease the rising black population. 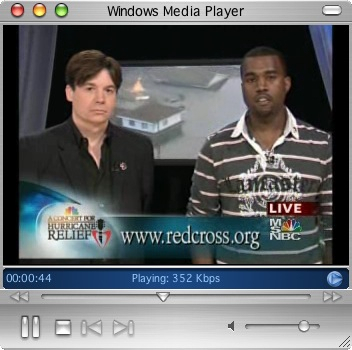 go on kanye! even tough i am a young sister an have been denied the truth about the world and the situations that occur in the world i still remain ignorant but yet also falsely informed about this situation by bush himself through white people that work for him and brainwashed black peoppe . i have nothing against white people i have issues against bush and yes i have to admit he is the most powereful in the world but not over the world. I did not vote for bush!